Bostonas latviešu ev.-lut. Trimdas draudzes jaunatnes pulciņš cēla baznīcu draudzes lauku īpašumā. Baznīcu 1959. gada septembrī iesvētīja prāv. K. Birznieks. Baznīcas projekta autors bija toreizējais arhitektūras students Dzintars Lauris. Baznīcas altāru pēc V. Vītola zīmējuma gatavojis Jānis Galiņš, sen.. Bērzu aleju iestādija lai aicinātu ik katru iegriezties Piesaules baznīcā. Piesaule was established in 1954 by the Patrons of the Latvian Lutheran Church of Boston as a summer church camp. Initially, there were only a few buildings on the 360-acre site, including the main house, barn, and a hunter’s shack (later rechristened the Boys’ Cabin). As interest in the camp grew, so did Piesaule. A man-made pond was created in an area where several natural streams crossed – “Bebrupe.” The Girls’ Cabin was built in 1964, and parents of the camp-goers began to build summer cottages to ease commuting between the city and the camp. Many of these cottages have been passed along to younger generations of the original families. The youth of Boston’s Latvian Lutheran Church’s congregation built Piesaule’s chapel with their own hands. 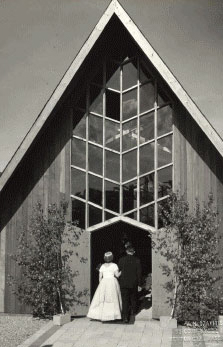 It was christened in 1959 by Bishop K. Birznieks. The project was led by architecture student Dzintars Lauris, and the church altar was based on drawings by V. Vitols and designed by Janis Galins, Sr.. A row of birch trees was planted to invite guests into the church, which accommodates 130 parishioners.